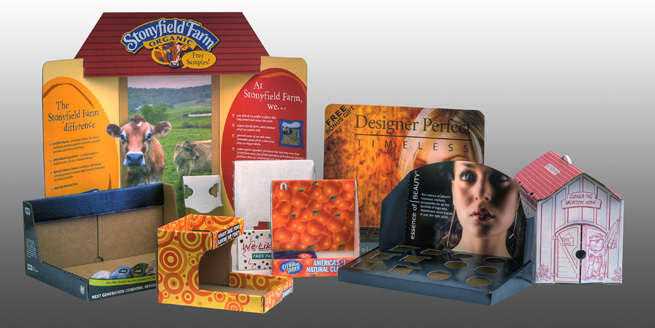 Romanow Container’s Design Department specializes in creating traffic-stopping Point of Purchase (POP) displays for our customers throughout New England. Free-standing floor displays, end cap displays, counter displays, dump displays... you name it and we’ve done it – for some of the biggest names in consumer products. At project inception, your account executive – along with a member of our Engineering and Design Department – will sit down with you and discuss your goals, your product, the display type, budgetary considerations, the retail environment in which the display will be featured, as well as the wide range of aesthetic options available to you. Based on that discussion, our design team will go to work. If you’re like most of our customers, you’ll be extraordinarily pleased with the results.